The bicycle is of a fabricated pressed steel frame, painted red with front wheel drive but no chain. It has a two-speed gearbox built directly into the hub. The pedals are built into the front wheel spokes and are of black rubber with orange reflector strips. The front and back wheel brakes are operated by a single brake control on the right-hand handle. It features a T-shaped handle bar with black and red rubber grips on the handles. The bicycle features a broad triangular angled seat upholstered in ridged black vinyl. The seat is suitable for riders from 4 ft 9 inches to over 6 feet. Other features include a steel rectangular bicycle rack over the back wheel, white plastic mudguard over the top of the back wheel, a reflector light under the seat, and a bike rest on the left hand side. It has two transfers with ?Acrow? on each side of the hub. In 1936 a 24-year-old Swiss national, William A. de Vigier, had the idea of manufacturing an adjustable (telescopic) steel prop instead of the wooden construction props in use at the time in London. While he was raising funds to form a company, de Vigier met with a solicitor, Arthur Crow, who agreed to reduce his fee in return for having the company named in his honour. ACROW would then appear at the head of any alphabetical listings. The company expanded rapidly and by 1950 had extended its business overseas by purchasing a small engineering company in the Sydney suburb of Lidcombe to establish Acrow Pty Ltd. The factory was retooled to produce Acrow building products such as props, clamps and then steel formwork and became so successful that branches were soon established in other states. In 1957 the company won the contract to supply a massive 19 ft (5.8m) telescopic tunnel form for the Tasmanian Hydro Electric Commission and in 1961 they produced a huge mobile concrete lining form for the Snowy Mountains Scheme. The company's range continued to expand to include such diverse products as beverage dispensers, water tanks, a 7-in-1 utility knife and racking systems. More branches were established and Acrow Australia Ltd became a public company in 1968. In 1971 the Australian company established its first international branch in Fiji. New products continued to be developed and in the early 1970s Acrow supplied horseshoe tunnel lining forms for construction of the Eastern Suburbs railway in Sydney. In 1977 the Lidcombe premises were sold and the business transferred to nearby Guildford. On the advice of its parent company, Acrow acquired the Australian subsidiary of the company Coles Cranes in 1978. However, due to supply problems from the UK, cranes could not be assembled reliably on time in Australia. Three Colossus cranes were sold to Patrick Stevedoring but disaster struck when one of the cranes collapsed during testing in Sydney. At the same time as the company was experiencing ongoing losses from this setback, a concept was developed for a simple low-cost bicycle. The company history written by former Divisional Director, Ben Wassens, records that the concept was submitted in 1980 by John Sanders and Keith Bloodsworth and that work began on a number of prototypes. A Sydney studio, Design Field, was commissioned and its Principal, Paul Cockburn, designed a revolutionary front-wheel drive chainless bicycle for the company. Having divested itself of Coles Cranes the following year, the company's fortunes recovered to some extent before the recession hit. Notwithstanding these problems, the company saw huge potential in the world market for its new bicycle which it exhibited at Techex in the United States in 1984. Negotiations began immediately with the Jiangmen Bicycle Company in China and a licensing agreement was signed in November which was believed to be the first of its type between the Chinese Government and an Australian company. After 34 successful years and take-over offers by several companies 90 percent of the company's capital was acquired by a New Zealand company, McDonnell Dowell Corporation, in 1985 and control passed into their hands. Although the revolutionary design had been well received, the Acrow bicycle did not go into commercial production. Two hundred units were made in the first run and these prototypes are extremely rare. 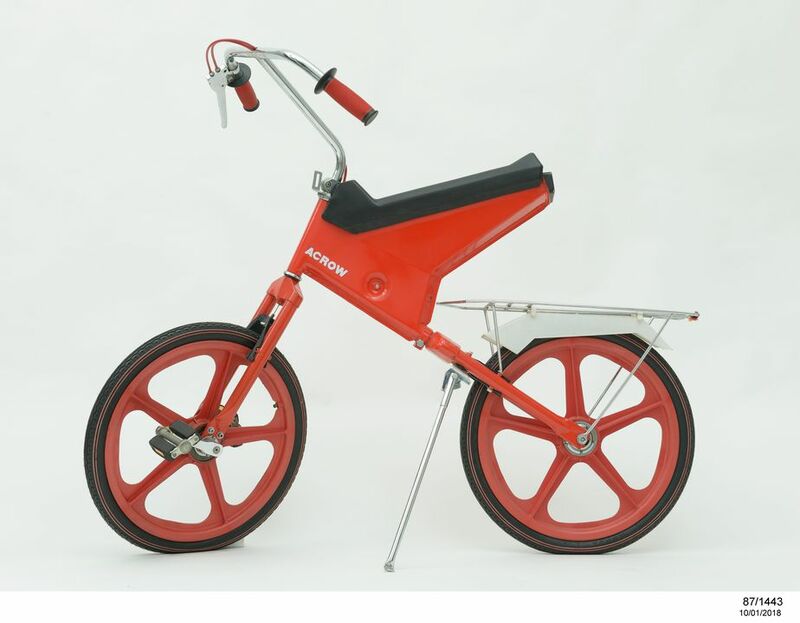 This is an innovative design for a 2-speed front wheel drive bicycle made by Acrow in the Sydney suburb of Guilford in 1987. It is a production prototype acquired direct from the manufacturer, Acrow Pty Ltd of 11 Ferndell Street, Guildford. The bicycle was designed for Acrow by Design Field of 1 Caledonia Street, Paddington. Apparently the Acrow bicycle did not go into production in Australia. This object is currently on display in Design Nation at the Powerhouse Museum.